As mentioned in my last post on watering your foundation; Here in North Texas it is essential. Since this is not a one time event but a regular requirement, you might as well look at a relative permanent approach to the solution. I identified several ways to do this in my last posts on the subject but I wanted to share a bit more permanent method. The concept is the same, but its a bit more work, and you may want to hire an irrigation specialist to do it. The biggest difference in this solution is capitalizing on the fact that you may already have a permanent in-ground sprinkler system. With this system, you operate it as any other section to your irrigation system profile and its no longer a separate system to take care of. 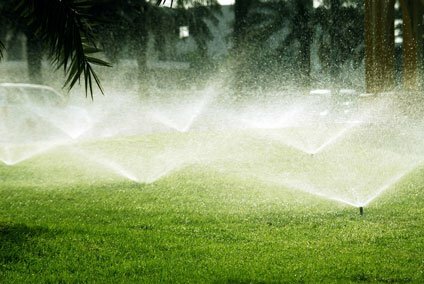 Criteria of existing lawn sprinkler system: For this to work, you need an automatic lawn sprinkler system and a couple more conditions to make it work. 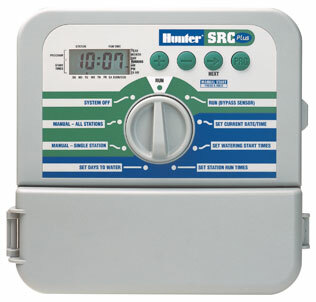 Electronic Irrigation controller: The irrigation controller will be the source of the schedule to water the foundation. Spare Wire: In many cases during the initial installation, the cable with the zone wires in it, may exceed the number of connected zones. So look for some coiled up wires in the base of the controller. If that is the case, you are in luck and can use one of the spare wires. If you have no spare wires but a spare zone on the controller, you would have to add a pair for the new zone. (a colored wire and a common (white) wire). Adding a New Valve: At this point, you have a 1)zone position in the controller, 2) a spare wire for the new zone. Now, locate all the existing valves in the yard. Specifically ones that are close to the house. In that valve box, look for the same color wire you identified in the controller, if it is not there, check the other valves. Worst case, you may have to bring a new wire to your chosen location. Dig up around the existing valve and identify which pipe is under pressure all the time. Once identified, turn the main water supply off that feeds the sprinkler system (probably near the water meter), you will cut into the pipe and add a new valve. You may have to run a short piece of wire from the existing valve to the new one to hook it up. The connection will be one colored wire and one “Common”. When you buy the new valve, make sure it has (low) flow control, and or is designed to work with zones that don’t use a lot of water pressure. The drip lines you use have a low GPM (gallon per minute) rating as well as low pressure. Polypipe: Depending on where you locate the new valve, you may need a section of polypipe to get you to the foundation. You can cut the hose to length and use the polypipe fittings to make up the ends. Make sure the polypipe and fittings are the same dimensions. Since all these connections are on the low pressure side of the system, these fittings are just simple resistance (chinese finger) snap in connectors. Drip Lines: From the poly pipe, use the same fitting to transition to the Drip Line. These hoses are designed with drip emitters in the hose every 12 inches. Run it around the house keeping it about 6 inches from the foundation. You can bury them a couple of inches or hide them with mulch. Staking them with landscape stakes will help keep them in place as this product does not like to lay flat to the ground. You can purchase the hose in bulk from the Orange Box store of Sprinkler Warehouse. 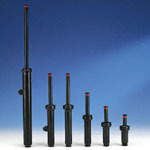 You will need to also purchase inter-hose connectors as well as a way to connect to your water. If you have to make a sharp turn it is better to use a fitting than bending the pipe. You do not want to crimp the hose. Splitting the line with a Tee is totally acceptable, and it will also allow a little better flow control if the go half way around the house with one feed and half with the other. So here is what it looks like in dollars. Admittedly, you can probably do this a little cheaper, but I used high quality components, so this should last for years to come. Lawn Sprinkler Nozzles, Can Changing Them Make a Difference? Heavy misting of the sprinkler heads can result in as much as a 25% loss in water. New sprinkler heads and nozzles coming on the market are claiming sizable water savings, but how much water can you really save (if any)? Stream sprayers are normally found only in orbital or rotary heads and are typically found in larger landscaped areas and can be spaced 20′ to 30′ apart. With an open landscape, these heads can water more ground with less water. Up until now, there have been few options for smaller residential properties other than traditional pop-up heads using spray type nozzles. Spray nozzles are designed for spacing limitation from 8′ to 15′ and as with any type water sprayer, there is a correlation between distance and trajectory or arc necessary to obtain the distance. The greater the distance, the greater the height of the arc to obtain the distance. Greater distance = greater misting. But trajectory alone is not the only culprit to misting. High winds, high pressure, evaporation and excessive overspray all contribute to the water loss factor associated with misting. This misting can account for a loss of 10-25%. It’s this misting factor (more characteristic of spray nozzles over stream nozzles) that contributes to a lower efficiency found with the spray nozzle. And its the low misting factor found with the stream sprayer that makes for an attractive alternative. In an attempt to make automatic sprinkler systems more efficient, some manufacturers have created a stream type nozzle designed as a direct replacements for the standard spray nozzle (aka pop-up sprayer). If you have read my earlier posts on lawn sprinklers you know that pop-up type spray heads can lose 10% or more of their water spray to the wind and evaporation. Before we look at the differences between spray nozzles and stream nozzles, lets consider the ways to reduce sprinkler misting. Some of these items can be readily addressed, some are design considerations. Standard Spray Nozzles: Standard spray nozzles atomize the water to equally spray or spread the water out in an even flow throughout their spray pattern. They are great choice for small residential properties as they provide good water distribution in a reasonable amount of time. Additionally they have many different nozzles to fit the various application requirements. To much pressure: Optimally pop-up sprayers work best at 30 psi. High pressure can cause excessive misting. TIP: To test the zone water pressure, you have to remove a head, replace it with a riser and thread on a water pressure gauge, then run the zone and check the pressure while the zone is spraying water. Don’t water during high winds: This can be managed manually or you can add a wind anemometer to your sprinkler controller that will shut down the system at certain wind speeds. Even though we typically water in the night-time hours (to avoid excessive evaporation), windy conditions are as common during the night-time as during the day. Keep water spray output close to the ground: This can be achieved by designing a system where the heads are closer (such as 10′ apart compared to 15′ apart) Spray nozzles with shorter patterns use lower trajectories, will atomize the water less and have less distance to fall to the ground. This item has to be addressed during the initial design as shortening patterns in an existing system could be considered a “do over”. I designed and installed my current system prior to stream sprayers, I took this approach by using 10′ radii heads. The water stays very close to the ground when the system is running. Granted, it caused me to use a lot more heads and zones. If I were to tackle it today, the stream sprayers would not only impact my water usage, but cut back on material and zones installed. Deliver the water in streams not in a spray or mist: The more you atomize the water, the lighter it becomes, allowing the wind to cause the water to drift away and evaporate before it has time to absorb into the ground or plant material. Deliver water directly to the roots through drip irrigation. Flower beds can be easily converted (assuming your sprinkler system has specific zones for flower beds). For grass and turf this is a bit more involved but plausible. In my current system I created specific zones for the parkway and driveway. Using direct bury drip lines, I am able to keep the turf green with virtually no run off. This is another condition that would need to be addressed in the original design. Refer to the Alliance of Water Efficiency, for additional water saving tips. There is a fine line between efficient water delivery and adequate water coverage. Many irrigators will “over cover” an installation to ensure all the grounds receive adequate water. The Irrigator wants to over-saturate the turf to avoid brown spots or low coverage areas, as making a re-trip to install additional heads can be costly. Creating a system that uses excessive water will cause them less problems in the long run. But in doing so, there may be a high degree of waste associated with the design. 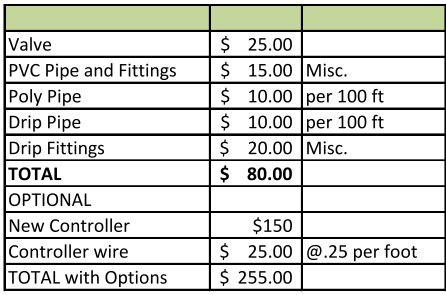 Don’t get me wrong, the lawn sprinkler business is very competitive and most people won’t spend the money to get a system with high-efficiency. Since water is still cheap and fairly plentiful this methodology will be with us for a while. However, the purpose of this article is to attempt to make your existing system more efficient and if you have a decent design, you can make some reasonable changes that will not terribly affect the performance of the system. Stream Sprayers: Stream spray nozzles provides multiple streams from the nozzle in the defined pattern (90, 180, 360 degree pattern). To provide adequate coverage, the streams spray in a rotation throughout the pattern. The beauty of the stream type nozzle over the spray nozzle is it will project water similar distances without high levels of misting. However, based on their delivery you may actually have to run the systems longer to get similar watering results, but since they are more efficient, it will not negatively impact the system performance. With the move toward greater efficiency, the stream principle has been introduced to traditional pop-up sprayer. Some manufacturers provide them as replacement nozzles, where others require you to change out the complete head. TIP: Look at one of your spray heads to determine the brand, go online to see if the manufacturer makes a replacement nozzle, don’t be surprised if your local orange box store does not carry them. I have used Sprinkler Warehouse for many of my sprinkler parts and speciality items. The Test Case: I created a model zone with 4 heads, 2-180 degree heads and 2-360 degree heads. I used the Toro 570 model body as it can be equipped with either the spray nozzle or retrofitted with the stream nozzle. Optimally, the comparison is based on a 30 psi rating at the head. In converting the system from spray to stream we need to match the pattern as close as possible. Since spray heads are a mature product, many patterns and styles are available, but with the stream nozzles, the available styles are still limited. With the Toro brand, the new stream nozzles are not a direct comparison in spray distances and the stream nozzles may have to be tuned to reduce the pattern to avoid excessive over-spray onto the sidewalk. But they were pretty close. From a cost comparison, it is beneficial to be able to re-use your existing spray heads if at all possible, as having to buy new heads as well as the nozzles will add up quickly. When you look at the water saved vs. the cost of the change, it did not prove out (for me) since water is still very cheap. However many municipalities tack on additional charges based on water usage, so it could make a difference for you. If you are interested in seeing how much difference it makes, take the water saved (listed in the table and calculate it against your dollar per gallon charges found on your water bill. Based on the results of the chart, here is my observations using the 10% de-ration chart. It requires 86.72 minutes using the stream spray nozzles to provide the same precipitation value as the spray nozzle provides in 60 minutes. 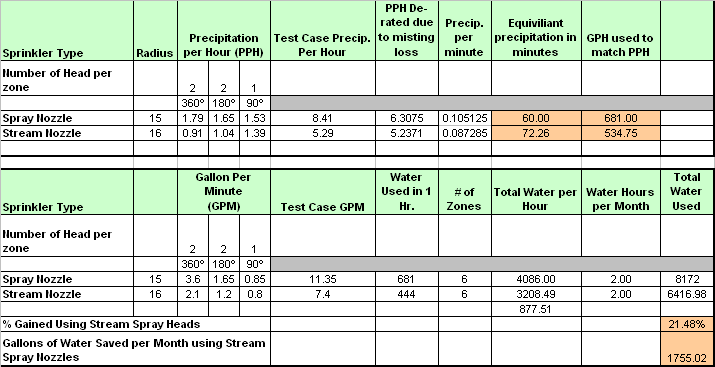 Factoring in a 10% misting factor, the stream sprayers use 5.77% less water or 471.63 gallons of water per month. At a 25% deration the numbers are a bit more dramatic as you could save over 1700 gallons of water per month. Consider using the stream sprayers in a new design as you can use less heads, less zones, less pipe, less fittings as well as less water. 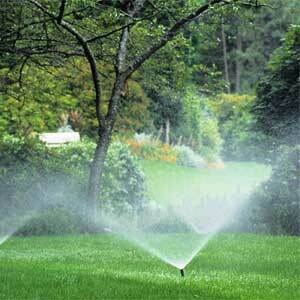 Convert existing sprinkler zones to stream sprays where high wind is normal or misting is excessive. Recommendation: If you choose to replace your existing nozzles/heads, change one zone at a time. Let it run through part of the season, compare the results by looking at your turf . For proper watering don’t mix spray nozzles with the stream nozzles in the same zone. To obtain an adequate amount of water similar to the spray nozzles zones, the watering time may have to be increased on the stream nozzle section. 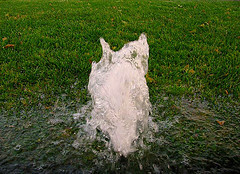 To see the entire series of lawn sprinkler articles go to Lawn Sprinkler tab on the HomeownerBOB web page. Recognizing a water leaks within a sprinkler zone can be difficult as they may not reveal their location until under pressure. 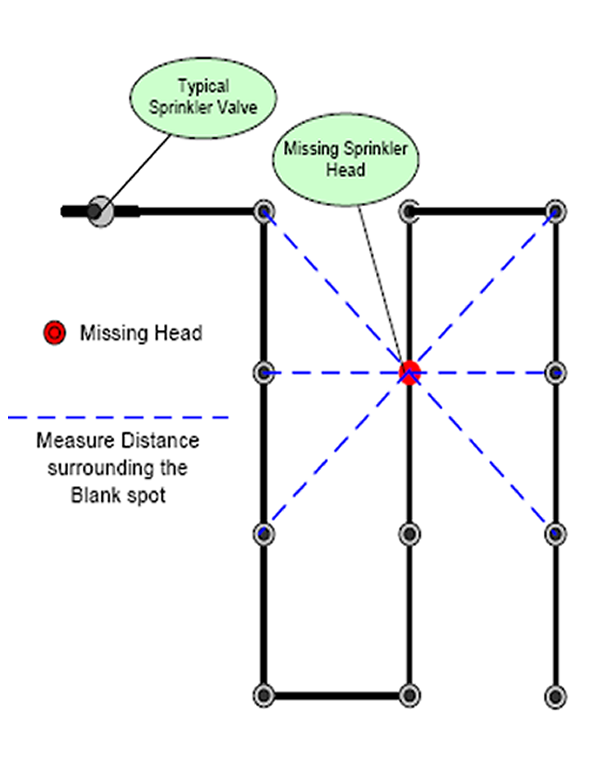 How do you recognize a minor leak in the sprinkler zone if it’s not obvious? The first noticeable trait would be the zone does not appear to cover the ground as well as it used to. You may also recognize plant material or turf that appears dry or starving for water. Moist mucky dirt, soggy spongy area(s) in the yard. Someplace that never seems to be dry. New or additional brown patches in the turf indicating low water coverage. Weeping heads: A slight amount of water is passing through the valve when it should be closed. The sprinkler heads remain wet well after the sprinklers have run. Typically, disassembling the valve and cleaning will correct it. Dirty heads: Dirt, pebbles and grunge can lodge itself in the sprinkler nozzle as well as the body and shaft of the sprinkler head. These problems will modifiy the pattern, providing excessive water in the wrong places. Start by replacing or disassembling the head and cleaning it. TIP: Like for like heads and nozzles will reduce complications in future repairs. When a sprinkler zone is turned off, typically the lowest head in the zone becomes the relief valve causing water left in the lines to drain out. This is very normal. However, in doing so, a suction is created that can pull in surface water, and dirt from around the other heads. This dirt can migrate throughout the zone clogging the other heads. TIP: If the location of the low head is in a bad place, an in-line drain can be installed in the pipe, but you will have to dig up the pipe to do it. Broken head: Obvious water spray outside the defined pattern. This can be corrected by replacing the head or the broken parts. 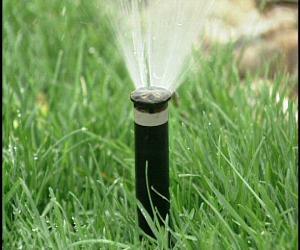 TIP: Keep extra sprinkler heads to replace bad ones. Rebuild the old ones if you can. Remember to reuse or replace the nozzle like for like. Many times you can replace the entire head without disturbing the surrounding dirt. This reduces the opportunity of allowing new dirt into the system and keep you from having to to dig the head up. Lawn butchers: Weed Eaters and edgers are the death of lawn sprinklers. They can easily destroy several heads over a season of mowing. Allowing dirt in the system: No different than the water system in your house, allowing dirt in the pipes creates opportunities to clog valves and heads, creating more work for you. When working on sprinkler heads and valves avoid this by taking the appropriate steps to stop surface water back into the system. When you run a zone and identify a head that needs attention, removing the head may create a suction that will pull water and dirt into the pipes. Admittedly more work, by digging up the dirt from around the head and getting the hole deeper than the head connection can reduce the opportunitiy of allowing dirty water into the sprinkler system. TIP: If there is no standing water at the head, attempt to change it without digging it up as described in number #3, this will save you some time. If you have corrected the problems associated with the above list and you still have problems, its time to look deeper into the system. Most likely, if you have gone this far you are recognizing that a specific zone does not present the same pressure, or cover its area as well as the others. 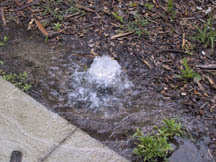 This trait is an indication of a pipe, joint or fitting leak, and the leak is large enough to reduce the zone pressure but not enough to create a pool or hole in the lawn. Assuming you have pop-up type heads, adjust the screw on the top of the nozzle (on every head in the active zone) to shut off the water on that head(s) TOTALLY. This increased pressure may be enough to cause the small leak to burst. Continue to walk the sprinkler zone looking for mushy ground and water pools. Also, go look at your water meter for measured water usage. Look for the meter to be moving at a medium to rapid pace (make sure everything in the house is turned off). TIP: Since lawn sprinkler heads are not rated to hold full pressure like a faucet, some small degree of water oozing is acceptable. If you have other styles of heads or #1 didn’t find it, this step #2 will be dirty wet work. Conceptually, it’s the same as #1 but requires you to expose each and every head on the zone and install a threaded cap to replace each sprinkler. In this method, you have to remove all the heads from the equation and the zone should hold pressure just like any pressurized plumbing line. Check the water meter; if you still see a water loss, leave the zone on for 2 or 3 hours, or even the whole day. Again, look for water pools or mushy ground and check your meter. Unfortunately many of us require lawn sprinklers to have any kind of landscaping short of cactus, gravel and rocks. Having a lawn sprinkler system is kind of like garage door openers, once you have one its hard not to. Dragging hoses around the yard is a real pain and it becomes a challenge to keep things alive. Taking care of your sprinkler system will save you money, reduce the opportunity to waste water and keep your plant material alive. 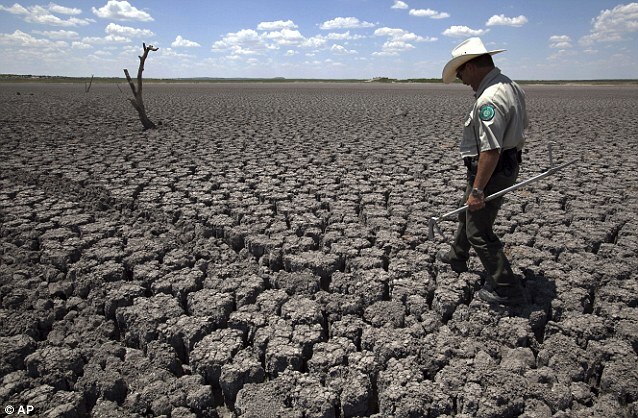 With water restrictions on the upswing, more and more cities are assessing fines for violating the restrictions. Check with your local municipality for restrictions regarding time of day, rain and freeze detection. Adding a rain sensor to your system is a wise decision. Because sprinkler heads are not under pressure until the system is live, it can be difficult to isolate the leaks. “Pop-ups” are the most common spray heads found in residential systems. Typically I find pop-ups require more maintenance than the larger impulse or stream sprayers primarily due to the fact that pop-up sprayer use less water per head and the water orifices are smaller and they clog easily. With pop-ups, it takes more heads per square foot to provide adequate coverage. The greater the distance between heads, the further the water has to spray. To do this, the arc in the spray pattern has to be projected higher in the air. As a result, you lose up to 50% of the water in the air. Up until the last year or so, we have seen little in the way of water miser type heads. These new type heads are designed to replace the pop-up with a miniature stream sprayer providing a coarse spray in lieu of a mist. This can help reduce water loss and your system may be retrofitted to use these type heads. However, it is important to match the right head for the system. When your system was designed, it was all based on a certain water pressure, pipe size and GPM (gallon per minute) volume, so any changes need to take this into account otherwise you may end up over/under-watering. Not that a DIYer cant figure this out, a good licenced irrigator can help you solve the problem. Also, take a look at this comparison study of nozzle types. Poor design: System design that allows sprinklers to spray water across sidewalks or concrete cause water to be lost to evaporation and run off. 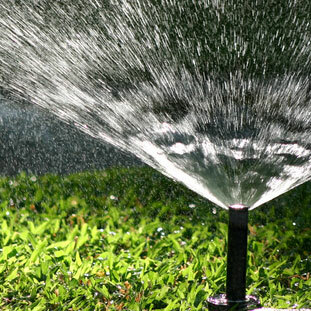 Wrong watering times: Running your water sprinklers in the middle of the day allows the water to evaporate before it has time to absorb in to the ground. Wrong water duration: Some believe short duration watering is a way to conserve water however, short shallow watering can cause turf and plants to experience stress because the shallow water can cause shallow roots. Dirty nozzles: Even though sprinkler heads (should) have filters underneath the nozzles, they can still pass some particles in to the nozzle. Many times these particles can be wedged in the spray nozzle causing it to mis-spray and not distribute water equally and efficiently throughout the spray pattern. Lack of maintenance: Sprinkler heads take a lot of abuse from lawn mowers, string trimmers and edgers. Whether it be abuse, leaky or bad sprinkler heads, all of these conditions can cause a lot of water to run down the sidewalk. Standard spray nozzles are approximately 50% efficient as the over-spray is lost in the air. Loss and waste in a sprinkler system can be difficult to recognize without taking the time to exercise the system and inspect each sprinkler head while running. Feeder or Pressure Lines: The side under pressure includes a cut off valve, double check valve (aka back flow prevention valve) and a valve for each zone and a lot of pipe. Distribution Lines or Zones: The system could include any number of zones, this is all dependent on the size of the system. The zone has to be running to inspect it for leaks. Since the sprinklers are spraying water, finding leaks can be a bit more challenging. Finding leaks in feeder/pressure lines is similar to the same process as found in the Chasing Water Leaks post. 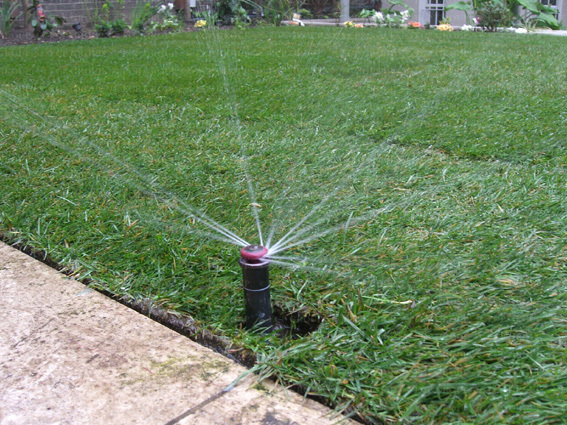 Turn off the main cut-off that will isolate the sprinkler system from the remaining water supply. If the flow meter stops proceed with the following steps. Locate each sprinkler valve in your system. If you are not sure how many valves are in your system, look at your Sprinkler Controller to identify how many sections or zones are in the system. Finding the sprinkler valve may be difficult as valves can be overgrown by grass or ground cover. If you have the original installation drawing, it should identify the approximate locations of the valves. Before you hire a professional, try the methods described in Searching for Lawn Sprinkler Valves. Either way, once you find them, take note of their location for future use. You may notice water residue around some sprinkler heads even when it should be dry, known as weeping, this could be a hint that the sprinkler valve is passing water when it should not be. Once the valves are located, they should be turned off, one at a time to determine if you have isolated the leak. Each valve has a manual cut off on the center top of the valve. Once you have isolated the leak to a specific zone, the problem will be resolved at the valve. (TIP: Sprinkler valve can be disassembled and cleaned without removing them from the system but the water must be shut off.) Most likely it just needs to be cleaned (that means taking it apart and removing any dirt or debris inside the housing), but it could have been damaged during the winter months, if so, you may need to replace the valve. 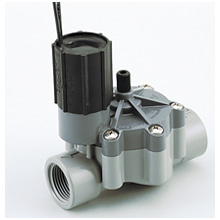 Read this tutorial for specific instructions on repairing a solenoid valve. Run each section one at a time. Walk the zone looking for excess water accumulation around the head, the seal could be bad or the head loose causing a lot of blow by. Try tightening the head, (yes, all this while the system is running). If none of this stops the excessive water, replacing the head and riser is the simplest solution. If the leak is around the stem or nozzle riser, you can take these head apart for cleaning. Perform this action with the water turned off. To avoid additional dirt in the system, its best to dig away the dirt from around the head, down to the connection otherwise dirty water will enter the lines. It’s important to remember to do your best job of keeping new dirt from entering the system as this will cause more blockage problems further down the pipe. TIP: Keep a couple of extra sprinkler heads around for spares and spare parts. Changing the head is lots less invasive and a 1 for 1 head swap out than trying to operate on the head in the dirt and water. You can also rebuild the removed head for future change-outs. If the head is not leaking inspect the pattern of the water spray. Different nozzles are designed with different patterns, so the spray could be limited by design to provide adequate coverage. There are too many nozzle patterns to discuss, but most importantly, look for a nice clean even pattern. If you see breaks or weakness in the pattern, the nozzle is probably dirty. Turn the zone off and unscrew the nozzle. There will be a filter in the riser. Clean the dirt out of it. Also inspect the nozzle itself for very small pebble grit lodged in the sprayer. Use a toothpick or very small screwdriver to remove these particles. The last item may require 2 people. Run the zone without the nozzle installed, this will blow-out any dirt particles that are below the filter. Tell your partner to turn the water off and grab the riser before it stops releasing water. This will keep dirt from re-entering the system. Re-install the filter and nozzle. Perform this same inspection with each sprinkler zone. If necessary, (while the zone is running) adjust any partial pattern sprayers that may be near sidewalks or driveways to keep the water spraying on the grass. If you have parkway sprinklers that are designed to water across a sidewalk (bad design) to water grass or plants, you may be stuck with leaving it alone since cutting it back may cause an area to be dry. Look at your water meter for any slow leak that may be caused by your sprinkler system. Isolate the sprinkler valves to determine where the leak is. Run each zone, inspect each head for leaks, also look for a good pattern and good coverage. Cleaning the heads may be required. 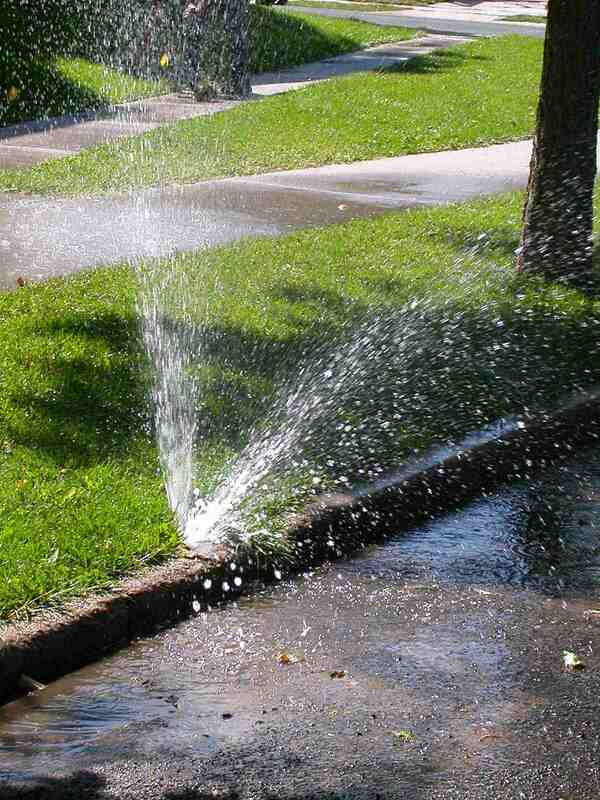 Adjust the sprinkler heads as necessary to minimize water over-spray on no-porous surfaces (sidewalks and streets). Adjust your water cycles to match the season. You are currently browsing the archives for the Conserve Water category.